The WIC program has traditionally been focused on the mission of improving the health of vulnerable populations by delivering nutrition services directly to low-income pregnant and breastfeeding women, infants, and children. The clinical approach used by WIC combines nutrition assessment, nutrition education, supplemental foods, and referrals to health and social services for individual clients and their families. These services are designed to promote healthy eating and physical activity behaviors and healthcare during a critical time period in a woman and child’s life. However, to create opportunities for program participants to make healthy behavior changes and access healthcare services, changes to policies, systems, and the environment are often necessary. Through a grant from the Centers for Disease Control and Prevention, the National WIC Association (NWA) funded 32 local WIC agencies in 18 states to plan and implement policy, systems, and environmental (PSE) change in their local communities. 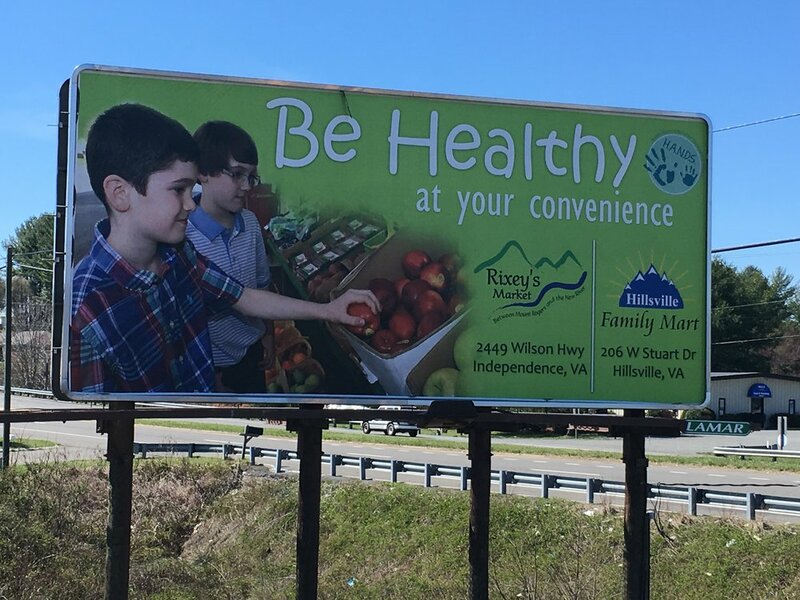 Through the Community Partnerships for Healthy Mothers and Children (CPHMC) project, agencies implemented several interventions to promote linkages to chronic disease prevention services and improve the local food environment. Agencies had a wide menu of choices in interventions they could implement, and they were required to build or join community coalitions, conduct a community needs assessment and work with partners to implement the interventions. 1. Creating or engaging with existing coalitions was a challenge for some WIC agencies, since they were not viewed in their community as leaders in PSE change and engaging in collaborative activities was new for many of them. However, while some agencies found it initially difficult to find appropriate partners to create or integrate into local coalitions, nearly all were eventually successful in engaging meaningful, working coalitions in the project. Coalition members included such organizations as SNAP-Ed programs, YMCAs, hospitals, Head Start Programs, food banks and pantries, and community clinics. Three-quarters of the local agencies were confident that they had found the right partners for implementing their interventions. Further, at the end of the project, the majority of them indicated that they would continue working with their coalitions. 2. In order to implement the project objectives, local agencies needed to develop partnerships with organizations and businesses where the interventions took place, such as restaurants, grocery stores, farmers’ markets, food pantries, physician’s offices and other types of partners. For many of the projects, this involved WIC for the first time in efforts to develop relationships beyond making referrals. Working with these partners changed both the role that WIC played in the community and how WIC was viewed by these entities. Project partners reported they gained a much better understanding of the WIC program and many indicated that the partnership established for the project would inspire future collaboration. 3. One of the challenges for both WIC and their coalition members and partners was that most local WIC agency staff involved in the project had limited or no experience with implementing PSE changes. However, after experience in forming partnerships to develop and implement their project interventions, and with technical assistance from NWA, most felt that they gained significant experience in PSE implementation, which would help their agencies to sustain efforts in their community after funding ended. 4. About half of the local agency project coordinators felt that they were extremely successful in implementing their project objectives, and the other half felt they were somewhat successful. Some of the factors that contributed to their success included engagement and collaboration from coalition members, strong leadership and support from their local agencies, and cooperation from partners in organizations and businesses to implement project interventions. Overall, the conclusion from the evaluation is that WIC can play an important role in creating partnerships to implement PSE changes for improving the food environment and increasing linkages for chronic disease prevention and treatment services. The CPHMC project clearly demonstrates that WIC agencies can successfully lead or participate in community-based initiatives to implement PSE change. While WIC agencies may not have as much experience in PSE changes as some other organizations, they learn quickly and have access to community partners, such as grocery stores, farmers’ markets, hospitals and healthcare providers, and health departments that can play a critical role in achieving PSE changes. Clinton County is a rural county in upstate New York with 81,000 residents. Low income is the County’s most obvious disparity. Approximately 1/3 of the total population lives in households with income levels below 200% of the Federal Poverty Level and about 1 in 5 local children live in a low income household. Nearly a quarter of the County’s total population is categorized as having “low food access.” Regardless of income, 75% of Clinton County residents do not consume adequate amounts of fruits and vegetables. In a recent community survey, one out of every four respondents reported access to healthy foods as a concern for themselves or their family. With a high proportion of low income families and many obstacles to accessing opportunities for health, it isn’t surprising the County also experiences higher rates of common chronic diseases compared to state and national averages. Due to these findings, Clinton County identified healthy food access as a priority for its community health improvement plan. A shy, but awesome, Clinton County Farmer helps promote Farm Fresh Cash. Although there are a number of farms in the region, it was discovered only a handful were offering direct to consumer sales. In addition, many of these farmers were not participating in state and national nutrition incentive programs. In 2016, multiple partners teamed up to change this. As part of the local Community Partnerships for Healthy Mothers and Children (CPHMC) initiative, project staff assisted a local farmers’ market program in recruiting farmers to become authorized to accept state and national nutrition incentive vouchers, such as WIC Farmers Market Checks, WIC Fruit and Vegetable vouchers and SNAP. The team educated farmers about the different programs, coordinated trainings for them and even provided guidance throughout the authorization process. Farm Fresh Cash can be used 7 days a week! To help household food dollars stretch even further for local families, farmers were also encouraged to participate in a local nutrition incentive program called Farm Fresh Cash (FFC). CPHMC project staff helped spread the word to local WIC families by creating and maintaining a listing of all farmers with direct to consumer sales, including location, hours of operation and the nutrition incentive programs they participated in. Farm Fresh Cash was launched in the summer of the 2016. In its first year, 21 local farmers and markets stepped up to participate in the program and nearly 800 residents received FFC vouchers (the program is on track to triple that number in 2017). In addition, five new farmers completed the authorization process to accept state or national nutrition incentive benefits. As a result, more residents are visiting local farm stands and markets and hundreds of local families have easier access to locally grown fruits and vegetables. Jackson County is ranked 75 out of 115 Missouri counties for health outcomes. One of the biggest burdens in the county is the high rates of obesity and diabetes. The Partners 4 Health project sought to focus on two particular zip codes within Jackson County (referred to as the Linwood Corridor) that face significant challenges, particularly in key drivers of health. The area is considered a “food desert” and the rate of WIC authorized stores is significantly lower than Missouri state rates. TMC Healthy Harvest Mobile Market delivers low-cost, high-quality fruits and vegetables to underserved communities. Through this project, a new stop was added across from the Linwood YMCA, a key community partner. The project began with receiving feedback from WIC participants that access to high-quality, low cost fruits and vegetables was a challenge. While several convenience stores and a few smaller grocery stores serve the area, the availability of fresh produce is at times limited, low quality and/or high in price. Because of a lack of full-service grocery stores in the targeted area, we focused efforts on access through two existing mobile markets. 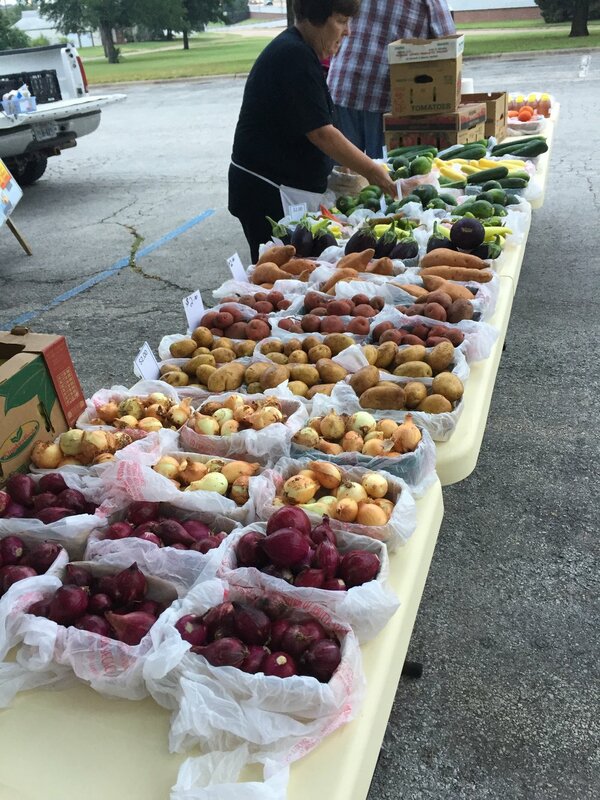 The Truman Medical Center Healthy Harvest Mobile Market (HHMM) sells fruits and vegetables to underserved communities. Rollin Grocer is a full service mobile market that brings a variety of groceries, including fruits and vegetables, to the urban core. A key coalition partner, the Linwood YMCA, serves as a community hub for physical activity, community involvement, healthy cooking classes, and will soon be opening a healthcare clinic co-located at the newly renovated location. Through the coalition and leadership team, the HHMM added a new stop to its schedule to include the Linwood YMCA! This new stop provided increased access to high quality, low costs fruits and vegetables in the targeted area. The new stop was added at the beginning of the 2017 market season and has since steadily grown in attendance. Coalition members have worked together to promote the new HHMM stop and support our HHMM and YMCA partners. The leadership team is committed to continuing this work, and we will still meet monthly to brainstorm ideas and tweak our approaches for promoting and connecting community members to the HHMM, as well as other resources for healthy living. Rollin Grocer has partnered with WIC team members to help adjust their inventory to meet requirements to be a WIC-authorized vendor. Rollin Grocer has submitted a pilot proposal to the state of Missouri to become WIC authorized and participated in a positive site visit with the state WIC director and vendor coordinator this year! While approval has not yet been granted from USDA, the coalition and leadership team are hopeful that pilot status will be granted for Rollin Grocer’s innovative model. The leadership team and coalition partners will continue to advocate for approval and will work with Rollin Grocer to promote healthy items that they carry. If Rollin Grocer is approved, we will utilize our coalition partners to spread awareness of this new resources for WIC participants. Both markets have been engaged in sharing the coalition’s message about health- 12345 Fit-Tastic!- through print materials, grocery bags, t-shirts and new resources with healthy recipes, storage and prep tips for fruits and vegetables and chronic disease prevention information. We look forward to opportunities for the coalition to provide healthy lifestyles messaging and information to the mobile markets and for the coalition members to continue to promote the mobile markets to the families they serve, into the future. The Linwood Family YMCA staff sport their 12345 Fit-Tastic! t-shirts on Wednesdays to promote the new TMC Healthy Harvest Mobile Market stop at the Linwood YMCA. The coalition’s 12345 Fit-Tastic! message helps create a buzz around healthy eating and physical activity in connection with the project activities. The Partners 4 Health leadership team has been able to align the work of this project with other interest in the community around food “prescriptions”. By leveraging other funds, we have been able to provide coupons to WIC participants in the targeted zip codes which can be used to purchase fresh fruits and vegetables at the HHMM. The coupons are provided by WIC staff at WIC visits along with a fruit and vegetable “prescription.” By the end of June, more than 80 coupons will have been provided to WIC participants, along with information about the HHMM, to increase access to fresh fruits and vegetables and awareness of the new stop at the Linwood YMCA. In addition, healthcare providers from Children’s Mercy Primary Care Clinics have delivered about 300 food prescriptions to families who have been identified as food insecure. These prescriptions also include a $5 coupon to the family and information about the HHMM. In addition, the Linwood YMCA has been able to leverage grant funds to provide an additional 500 coupons to the HHMM for community members. We are excited to continue to move forward with these opportunities throughout the market season. Our next steps are to begin a qualitative evaluation to understand facilitators and barriers to using the coupon at the mobile market by working with researchers at Children’s Mercy’s Center for Children’s Healthy Lifestyles and Nutrition. Our leadership team will continue to meet to inform these efforts, and we are looking for future opportunities to utilize technology for food prescriptions and/or to promote mobile markets, as well as continuing to explore the intersections of healthy lifestyles and food insecurity. The momentum and focus created by this project has allowed us to align with existing efforts effectively. We look forward to continuing the efforts above through our coalition with support of the leadership team, which plans to continue meeting monthly. In addition, we are excited about furthering the relationship between Children’s Mercy and TMC-WIC with a new WIC clinic opening at the Children’s Mercy Primary Care Clinic in July. In May, WIC staff delivered training on the WIC program to healthcare providers in the Primary Care Clinic, which provides nearly 17,000 well-child checks annually. The leadership team looks forward to ongoing opportunities to connect and carry forward the project objectives through this new co-location. The leadership team is also looking forward to future opportunities through the new onsite clinic at the Linwood YMCA for community clinical linkages. Dr. Dean Ornish, world renowned heart surgeon and cardiologist, once described surgical interventions to treat heart disease in the absence of healthy lifestyle changes as if the sink is overflowing with water and you grab a mop to start cleaning up without first turning off the faucet. Doesn’t make much sense, does it? If the cause of the overflowing sink isn’t addressed, then you will be continually frustrated while mopping as hard as you can. What if every time a physician was asked to treat a patient they not only treated the problem but they also treated the cause of the problem? Effectively turning off the faucet. In Bonner County, Idaho an attempt to do just that is underway. Smoking is one cause of illness that most people are aware of. The American Heart Association has led the way in studying techniques to aid in smoking cessation population wide. One of the techniques identified involves an intervention by physicians. In some cases, this may mean writing a prescription for a medication to help ease the craving or to counter the effects of nicotine. But an equally powerful technique necessitates a physician looking directly at a patient and stating in no uncertain terms, “You must stop smoking now!” It is surprising how many patients state that they have never been told this by their own doctor and once they were told, they found the strength to stop. Others discovered that when told to quit, their desire to do so increased yet they still struggled with knowing the means to success. The Bonner County Coalition for Health (BCCH) has created a tool to help physicians tell their patients that they must make a lifestyle change now (like stop smoking or eat more vegetables for example) and to help them find the means to do so. The tool is called “Healthy Lifestyle Rx”. These are non-pharmaceutical prescription pads individualized to each health care organization. A physician may write a prescription and hand it to the patient just as they would a prescription for a medication. A cardiology practice might be most interested in stopping smoking and blood pressure management with a low sodium diet. An OB/GYN practice might be most interested in having their patient enroll in the WIC program or engage in a walking program. These specific recommendations will appear on their individualized prescription pad. Unique to this program in Bonner County is the addition of a website link. Each pad has the newly created BCCH website address printed on it. Since physicians are over burdened with paperwork these days, the idea of adding one more task was not well received. By adding a website to the pads, we have allowed the patients to go to a place to get clarification after they have left the physician office. The website offers a button that mimics the logo on the Healthy Lifestyle Pads for each organization. A patient simply finds the logo that matches the prescription they were given, clicks on it and is taken to the page that describes exactly what their physician would like for them to do. On Monday, April 17th awardees from CDC’s National Implementation and Dissemination for Chronic Disease Prevention program convened in Denver, Colorado for their Year 3 meeting. Coalition members from across the country participated in the four-day conference. 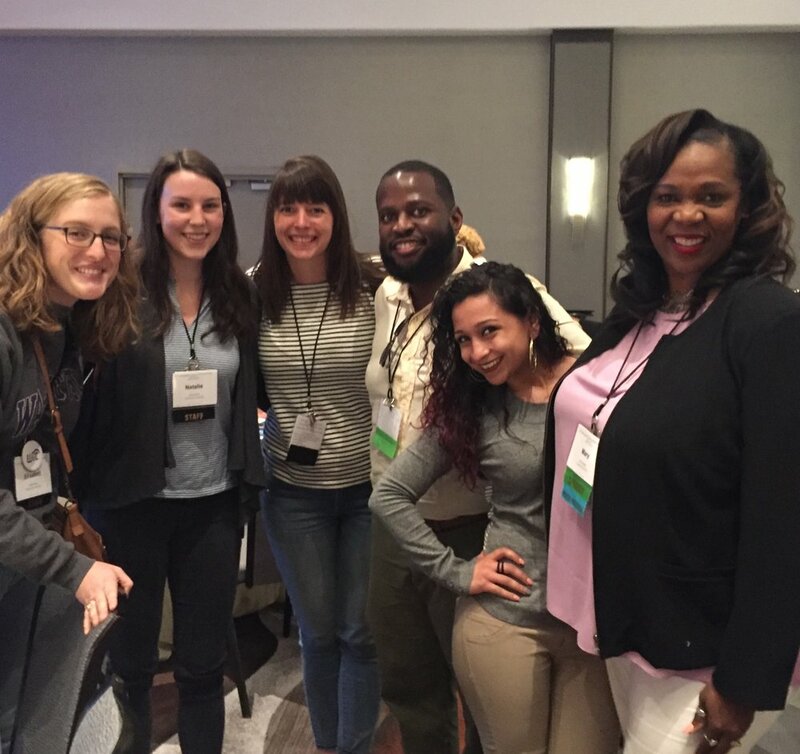 As Cohort #2 grantees approach the final weeks of their funding period, this conference was a great opportunity to connect both with Cohort #1 agencies, as well as other grantees of the American Heart Association and American Planning Association. Monday began with a welcome session featuring an overview of initiatives and accomplishments from project leaders at AHA, APA, and NWA. This was followed by a Welcome to Colorado from Karen McNeil-Miller, CEO of the Colorado Health Foundation and a networking reception with stunning views of the Rocky Mountains. Tuesday and Wednesday were filled with a mix of general sessions, facilitated dialogues, open networking opportunities, and a poster session. The general sessions shared accomplishments, partnerships, sustainability work, and innovative approaches; while facilitated dialogue sessions offered grantees space to discuss cross-cutting objectives and topical initiatives; and open networking sessions allowed for awardees to connect with other funders, agencies and coalitions. NWA was extremely proud to have multiple representatives from the CPHMC project highlight their work during general sessions. On Tuesday morning, Anna-Maria Roaché and Jeanne Mahoney from ACOG participated in the Power of Partnerships Panel, which focused on how collaboration can broaden reach and lead to greater successes when carrying out long-term place-based work. During the Health Equity session, Mary Schultheis and José Rivera from Crescent City WIC identified key challenges and conditions to consider when addressing health disparities at the local level. And on Wednesday, Bhagya Kolli and Amy Funk from the East St. Louis, Illinois project reflected on core initiatives that have been sustained after their funding period and how they maintained key strategies. Thursday morning featured eight unique options for mobile tours, which allowed sub-recipients from across the country to interact with successful local project staff and inspired new ideas, and approaches that can be proposed or adapted in their own communities. Attendees took to foot, bus or bike to experience mobile tours highlighting projects focused on such broad topics as WIC referrals, the concept of a built environment, overcoming health barriers, improving street and roadway access, downtown bikeability, healthy food procurement and local food hubs/urban farms. Following the tours, attendees gathered one final time for an invigorating closing session with Eduardo Sanchez from AHA. ACOG Presents at the SOPHE 68th Annual Meeting! On March 31st 2017, ACOG had the great privilege of presenting at the SOPHE 68th Annual Meeting! ACOG submitted an abstract entitled: Building Community Clinical Linkages: WIC Strengthens Provider Relationships. ACOG, along with other national partners which included: The American Heart Association, and the American Planning Association presented at the session entitled: Partnering4Health: The Power of A National Collaborative In Reducing Chronic Disease. Presentations highlighted project successes for sub recipients as well as how WIC and ACOG have effectively strengthened provider relationships through our community based project. We highlighted specific project successes, which included the successful inclusion of the CPHMC Project in the American Board of Obstetrics and Gynecology’s (ABOG), Maintenance of Certification process (MOC), as well as Breastfeeding Bootcamps, lactation rooms and support programs, non-pharmaceutical prescriptions and WIC 101 trainings. After the presentations, there was time built in for questions and answers, our presentation received a lot of interest, as many participants did not know what community clinical linkages were or what the WIC program entailed. This was a great opportunity to connect with other organizations and share best practices with others who are working to implement similar initiatives. The conference overall highlighted various areas of public health and included sessions regarding minority health, health equity, health promotion, and chronic disease prevention. There were also several round table sessions which touched on health literacy, health insurance, faith based interventions, food access and nutrition, and global health. We are looking forward to many more opportunities to share our work and the great work of our sub-recipients! Its Water Time at Sully Elementary! On February 15 2017, I had the privilege of being a guest reader for Loudoun County’s “Its Water Time!” Initiative. On this day, the program was being held at Sully Elementary, located in Sterling, Virginia for two classes of children in the STEP program. This initiative was developed through intensive research by this agency for best practices in drinking water promotion campaigns and increased drinking water access in school systems. Based off of this research, Loudoun County developed a toolkit entitled, “Summary of Best Practices in Drinking Water Access in Schools.” This toolkit was presented to the Director of School Nutrition Services by this local agency. Discussions were held regarding options for increasing water access in the K-12 school system. The toolkit was shared with other stakeholders in the community, including the Head Start Advisory Committee, which led to a partnership with Head Start and STEP as they worked to eliminate juice from their classrooms. A collaboration was created between the Head Start and STEP Program Director and Supervisors, and the “It’s Water Time!” program, a curriculum for preschool and elementary aged children to promote drinking water, was developed. This program has been performed for all 400 children enrolled in the Head Start and STEP programs throughout Loudoun County, and has helped teachers make the switch from serving milk, juice, and water to only serving milk and water in their classrooms. Reusable water bottles are also provided to every student and teacher to encourage children to drink more water. I joined Jennifer Brady, WIC Project Coordinator, and Michelle Apple, partner from George Mason University at the elementary school, and they proceeded to explain the order of the program. The “It’s Water Time!” program includes a water mascot, a storybook, a song and dance routine, a coloring page, and a parent educational flier. We began the first class with Jennifer introducing the program, she discussed the importance of water and asked the children if they drank water. The kids were so happy to see new faces in their classroom! They were also excited and engaged in the first part of the program. Jennifer then introduced the “It’s Water Time” mascot, Captain Hydro, and I proceeded read the story. The children loved the mascot and were interactive with me as I read the book. We then went on to sing a song and do a dance routine; the kids loved it so much we did it twice in both classes! After we conducted the activity, we passed out Captain Hydro coloring pages and walked around the room talking to them about the lesson and Captain Hydro. Each child has their own reusable water bottle so they can have their own “Water Time” during their class periods. The bottles either had the child’s name on it, or were assigned based on shapes that corresponded to a specific child. This was such a great experience to see the children in both class periods be so enthusiastic and ready to learn about such an important topic. Loudoun County has made great strides with this initiative and continues to see success. Jennifer shared an anecdote with me pertaining to the success of this program: at one of the schools, one of the bus drivers, requested that teachers require their children use the restroom before they got on the bus, as a result of the increased water consumption! They currently have classes scheduled to the end of February. NWA and ACOG are very excited to see the continued success of this initiative and this agency through the duration of the project period. Healthy donation items include: whole wheat pasta, canned fruits in 100% juice, low sodium canned vegetables, peanut butter and canned tuna in water. The Clinton County Health Department (CCHD) exceeded their expectations for the pilot food drive. Between October 26th - November 18th, Clinton County Health Department employees were tasked with donating healthier food items to a Department wide food drive. A total of 188 food items were collected and distributed to the area's main food pantries, Plattsburgh Interfaith Food Shelf and JCEO Outreach Center, just in time for the Thanksgiving holiday. Of the items collected, 87% met the healthy criteria outlined for employees at the last agency meeting. Selecting healthier, non-perishable food items requires some thought and label reading, but can be fairly easy if you know what to look for. For example, knowing that canned fruit in 100% fruit juice is a better choice nutritionally than canned fruit in heavy syrup, can make all the difference. Collecting healthier donations from the community allows Clinton Counties local food pantries to spend their budgets on perishable items that clients would like to see in their food package, such as fresh fruits and vegetables. When the fresh produce is available at the pantries, clients take full advantage because many do not have the opportunity to access fresh produce otherwise. The next step for CCHD is to partner with community organizations that coordinate their own food drives. CCHD will be able to provide engaging promotional materials and other resources to help encourage healthier donations. Loudoun County Health Department, located in Leesburg, Virginia, is one of the local agencies participating in the Community Partnerships for Healthy Mothers and Children (CPHMC) project, through NWA’s cooperative agreement with the CDC. 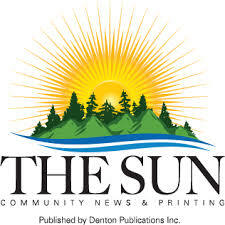 Loudoun County was recently highlighted in a local newspaper, The Loudoun Tribune, for their accomplishments in reducing childhood obesity. In Loudoun County, the childhood obesity rate among low-income residents is almost double the national average. Part of their efforts to combat childhood obesity involved a partnership with a professor in George Mason University’s Department of Nutrition and Food Studies, Dr. Gallo. This partnership has broken down silos in the area, and has resulted in cohesive collaboration within the community. Some of the interventions planned include, a program that aims to bring more fresh, local produce to families who need it most, a ‘Living Healthy in Loudoun’ resource guide, and increased access to breastfeeding services in the area. We applaud Loudoun County for their ingenious efforts and innovative strategies developed to combat childhood obesity in their community. Loudoun County Presents at the Virginia Department of Health! On December 8th 2016, members of ACOG and the National WIC Association attended a lunch and learn presentation at the Virginia Department of Health, in Richmond, Virginia. The presentation, entitled “Bridging the Gaps in a Child's First Food System”, was given by Dr. Janine Rethy of Loudoun County and Dr. Sina Gallo of George Mason University to present the findings of their WIC survey. The Loudoun County Health Department has successfully partnered with Dr. Gallo, a professor in the Department of Nutrition and Food Studies at George Mason University, for the past several years. Previous work included a survey of physicians’ breastfeeding knowledge, the results of which helped guide the development of Loudoun County Health Department’s “Best Practice Breastfeeding Support Implementation Guide for the Outpatient Office Setting”. This summer as part of the CPHMC project, the Loudoun County Health Department and George Mason University team conducted a survey of women who are participating in the WIC program to determine current breastfeeding practices, breastfeeding goals, timing and reasons for introduction of formula, and also vitamin D supplementation practices. The survey also assessed food shopping patterns and also chronic disease risk factors to determine conclusions and recommendations to help increase breastfeeding rates and retention within their county. Dr. Rethy and Dr. Gallo also presented on the current efforts spearheaded by Loudoun County through the CPHMC grant, which included the creation of the Loudoun County Business Case for Breastfeeding Toolkit for local businesses and government agencies, as well as the installation of two permanent breastfeeding rooms in their County Government offices and the introduction of a comprehensive lactation support policy, the first of its kind in the state of Virginia. It was a great experience for the CPHMC team to see this local agency present their data and show their work to others and to see all the great initiatives that Loudoun County has implemented. After the presentation, there were several in depth discussions regarding this topic and how to further Loudoun County’s initiatives. We are excited to hear about more of their innovative work for the remainder of the project! As a pediatrician, I have a front-row seat to how health insurance impacts the well-being of children. Nearly half the patients I see are covered by Medicaid or the Children’s Health Insurance Program (CHIP), both of which have comprehensive sets of benefits and are historically thought of as safety nets for the unemployed. However, you might be surprised to learn that the fastest growing users of these public health insurance programs for their children are employed and unable to afford or receive health insurance for their children through their employer health plans. To learn about this recent trend, our team at PolicyLab used survey data from 2008-2013 to understand the health insurance decisions working parents were making on behalf of their children. What we found is that low- and moderate-income families between 100 percent and 400 percent of the federal poverty level ($23,550-$94,200 for a family of four), whose parents were receiving insurance through their employer, increasingly looked to Medicaid or CHIP to insure their children. By 2013, the proportion of such families electing to cover their children through CHIP or Medicaid increased by 20 percent overall, and by more than 30 percent among families with household incomes between 100 percent and 200 percent of the federal poverty level, or up to $47,000 a year for a family of four. By 2013, one-third of working families in that income bracket were relying on CHIP and Medicaid to extend coverage to their children. These findings, published today in the December issue of Health Affairs, show just how important CHIP and Medicaid have become for working families. Some might question why families increasingly made the decision to move their children’s coverage off of an employer-based plan, and whether they should have been permitted to do so. Simply put, families were responding rationally to rapidly changing financial pressures. As employers faced the rising cost of premiums to insure their workers’ families (which increased by 41 percent to $17,000/year between 2008 and 2015), a cost that far exceeded that of providing single coverage (which reached $6,000 by 2015), their offerings began to change. Some employers began to drop dependent coverage from their available insurance plans, if they even offered insurance to their employees at all. Other employers increased costs that workers must contribute toward family plans, whether by increasing the premium they needed to pay, by increasing out-of-pocket deductibles they could expect to pay if their children got sick or by restricting the providers their children could see. Employees faced a dilemma: insure yourself for less money, or choose a plan that was either unaffordable or did not provide complete health benefits to your children. For many, the cost to cover their children became prohibitive: annual worker contributions to family premiums rose from $3,400 in 2008 to $4,700 in 2015. Deductibles also became more common, with the average deductible for an employer-based family plan rising from less than $800 in 2008 to more than $2,000 by 2015. What’s more, many employer-based plans did not offer reimbursement for vision, dental or mental health providers, which are commonly included in public insurance programs for children. As lower-income families experienced these changes, CHIP and Medicaid (if their children were eligible within their state) may have been the only affordable option if they wanted to continue insuring their children. By 2016, 35 million children in the United States were covered by Medicaid or CHIP, contributing to the nearly universal rate of children’s health insurance coverage in this country. By 2016, 35 million children in the United States were covered by Medicaid or CHIP, contributing to the nearly universal rate of children’s health insurance coverage in this country. However, CHIP funding is set to expire in September 2017 if Congress does not act to renew it. The arrival of the ACA in 2011, and the emergence of the health insurance exchanges by 2014, provided new options for parents to obtain subsidized coverage for themselves and their children if they could not receive insurance through work, or if employer coverage was unaffordable. Yet, like employer plans, exchange plans were often not promising for working families. Deductibles remained high, and they overwhelmingly lacked the comprehensive benefits that CHIP and Medicaid offer for children. Other parents were also unable (through a “family glitch” in the ACA legislation) to receive tax subsidies to enroll their children in the exchanges because the test for affordability only considered the cost of individual coverage, not family coverage that is much more expensive. Therefore, CHIP and Medicaid became the backstops for children in working families during this time, and will remain important if the ACA is not improved or replaced with law that provides better options for working families to cover their children. So, where does this leave us for protecting the nearly universal nationwide coverage we’ve achieved for children over the last 20 years? On the heels of this study, and with the change in our national direction following Election Day, many working families will rely entirely on Medicaid and CHIP to provide cost-effective and comprehensive coverage for their children. The maintenance and protection of these programs is now more important than ever. One need only look at a secondary finding in our study that serves as a bellwether warning for what might happen if Congress does not renew funding for CHIP before it runs out in September 2017. For working families between 200 percent and 300 percent of federal poverty level ($47,100-$70,650 for a family of four), who were not offered or could not afford dependent coverage for their children through their employer, we detected a 53 percent rise in uninsurance for their children. This was likely due to more restrictive eligibility levels for Medicaid and CHIP in their states, which left them with no affordable options and nowhere to turn for help. Families in those states were asked to make the difficult decision to uninsure their children and hope for the best. If Congress fails to re-fund CHIP next year, we will see this difficult decision play out for families all across the country in numbers we’ve never seen before. Protecting CHIP is now a no-brainer for the future health of our nation’s children. This article was reposted with permission from Policy Lab from The Children's Hospital of Philadelphia. Original post can be found here.